Great Wall Builders, Ltd. (OTC: GWBU) stock declined today which could be the start of the downfall of the penny shares since the hard mailers have reached their destinations already. GWBU stock dropped as low as $1.11 (dump) before regaining its composure to close at $1.58 on dollar volume of $22.3 million (15.5 million shares). Now, you are being asked to believe that GWBU stock could hit $15 with their not one, not two, but four news releases Monday about price targets, Q1 earnings and their partnership with the ghost company in Europe will produce €1.5 million in revenues in the next 12 months. GWBU claims that the 5 year agreement is for a minimum total wholesale purchase of €9.16 million of the iPollution patented Start Fuel Efficiency and Emission Device (FEED) units. This coincided with an article written on SeekingAlpha claiming to give a BUY alert with a potential $15 price target on GWBU. The only FEED that is going to be putting anything into production is the FEED that goes into the pockets of savvy GWBU stock traders who don’t holdout thinking it actually could get to $15. Remember when SNPK got its $9 price target and what happened to the share price afterwards? To say it was a sign of things to come knowing that the hard mailers have already hit their destinations and the stock has not had the “pop” having not yet reached $2, the $15 target price announced means this is the last week you can consider trading GWBU stock before it crashes. The Company filed their 10-Q with the SEC just after the market closed on Monday. Anyone finding it hard to believe that for the quarter ended March 31, 2012, Great Wall Builders had $0 cash, $0 property and…….drum roll please……..$0 total assets, is an idiot and Harry Lappa has some stock he would like to sell you. See the 10-Q filing for Great Wall Builders here. See the Great Wall Builder Hard Mailers here. Bottom Line: GWBU has to be on the list of penny stocks to watch simply because the MF trades so heavy each and every day for two weeks. 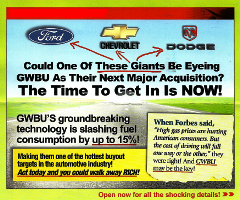 The mere fact that GWBU can have an intra-day low of $1.11 and be able to bounce for a quick 35%–45% gain intra-day makes it impossible to ignore. When will GWBU crash? Before it hits $15 a share that’s for sure. Last updated by Aim High Alerts at May 21, 2012 .